Have you ever read something that made you re-consider all you thought you knew about writing? Ok, maybe that’s a little too dramatic, a little too overwhelming to even consider, but what about reading a book that seems to break all the rules, and yet reads beautifully? 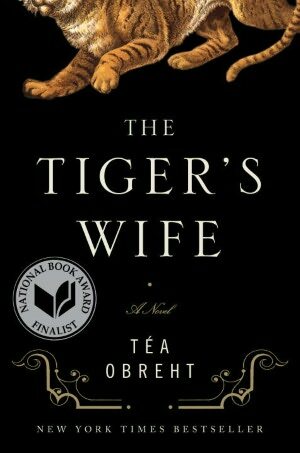 The book that got all this churning is Tiger’s Wife, by Tea Obreht. I’ve read the reviews, and it seems some people don’t agree with me that Obreht’s book is great, but enough do that she’s won some awards and been nominated for others, and she’s certainly generated a buzz. In reality, I think she mainly only broke one rule: her novel reads like short stories that were squeezed into one entity. The book consists of stories and various characters, and we move ominously (and often omnisciently) in and out of them. I can see that it can be confusing and odd, but I left myself go with it and it grabbed me. At one point reading Tiger’s Wife I thought to myself, this is how I would have written when I was in my early twenties if I had been writing then. This thought stopped me in my tracks. I realized that I was impressed with Obreht’s freedom of movement within her novel, and that in my twenties this freedom was innate in me. I scared by this thought: Was I being true to myself as a writer, or was I holding back, unknowingly following someone else’s standards? Now, in my thirties, I’m more stuck in some sense, more fixed. And when I write, I follow rules. And I do think we all need to follow rules. It’s just that for each of us those rules need to be different, and evolving, and most likely different for each piece we work with. I can’t write with the same movement I would have ten years ago. My movements now are big and vast, but they are taken with precision and aim. It doesn’t mean it’s better or worse, just different. Part of writing is about writing who we are. Today. And this is the best freedom of all. I haven’t read that book, so I can’t comment on that, but I relate to what you’re saying. Learning definitely changes us, usually for the better, but sometimes not when it concerns creativity. I’ve been thinking a lot about this lately. If readers react positively to a story, does it matter that it doesn’t follow the “rules”? I wonder if I’ve been guilty of stifling my creativity by adhering strictly to what, in many cases, are only others opinions or preferences. I think it’s another case of a really hard balance to always hit, Linda. We read, we are influenced, and this imitation can be sometimes stiffling I think if we are not paying attention. It can be so hard at times to differentiate our own personal drives and preferences to those of others around us. I know you are beginning a new piece, and I hope you find that wonderful balance, Linda! Sorry, Jennifer. I realize now my response did not speak directly to your conclusion. So yes, I think it’s only natural that our writing changes with time because our perspective changes. The young are rebel more easily because they are not fully formed — they’re trying to find themselves. However, that’s not to say we shouldn’t keep the spirit of that rebellion, ever-seeking to discover ourselves in a new way. Thanks,Linda, for this. Yes, it’s a life long journey of keeping the wonderment alive. I hadn’t thought about my writing in terms of how it’s differed according to my age until now, but it really has. Yes, absolutely! That’s exactly what I feel I’ve just been realizing: it’s not that one piece (or age or stage’s work) is bad, because my “new” stuff is better, thereby making the “to come” stuff somehow the best–it is all exactly what it needs to be, what it _is_. Yes, because after all, we are the writers that we are–something that will always be true even as we’re changing . Thank you for this wonderfully affirming post. I love it when I’m working out something in my head and I come across words and ideas that help me solidify my feelings that much more! p.s. I’m definitely putting Tiger’s Wife, by Tea Obreht on my to read list. It does seem like a lot of people are rumminating right now, Ev. Could be the new Year, and for those us up here, it could be the January hibernation that makes us all slow down and start considering more rather than pouncing and acting. Ev, thank you for the kind words! When I read your post I found it equally as affirming! As I have aged up I have found that there is a pull away from all that does not follow a prescribed order…in writing and in life too. Age has shown the need and the benefit of a certain order but there seems to be balance that must be struck between order and a certain amount of healthy chaos. I do endurance sports and besides the many other benefits of this pastime, it keeps me from thinking old. When screaming down a hill, just letting yourself and the bike just go, feeling the wind on the face, hear the increasing hum of the tires on the pavement, and feel the rush of a certain childhood again. Then, the ride becomes sane again. The balance has made for a great ride. I love what you say here, Marvin! In my eyes there is no such as ‘old’. I think we can make ourselves feel old at any age. I’ve seen 20 years old who are as tired and run as if they’d lives 90 years, and 80 year olds with the stamina and enuthisasm of a 30 year old! Interesting. I remember being fascinated with the idea of entertaining lives/short stories in my twenties. I was convinced that’s how I was going to write. It didn’t quite happen that way. Have you read Kate Atkinson? I just finish “When Will There Be Good News” (loved it). It multiple protagonists (one per chapter) whose stories weave together. I haven’t read “the Tiger’s Wife,” but they sound like similar structures. I haven’t, Cam, but I’ll look it up – thanks for the referral! Fascinating entry, Jennifer. You write that, since you are in your thirties, you tend to follow the rules. I’m not sure how much of that is age group or gender or background or life experience. I didn’t know what the rules were so I didn’t know I was breaking them. As I peek around the corner at the big five-o, I am less concerned about rules and far more interested in voice and style, expressing the story the way that I want to express it. With or without the rules, I hope you are enjoying your journey. Hi tikiman, I am sure there plenty of rules I know nothing about yet – I’ll learn those as I move along I hope. My age for me is just a point of referene, other than that it’s quite meaningless. We’re all different at different times. I just remember myself at that age being a certain way, and I see myself how I am now. Voice, style, expression, and doing it the best I can possible can right now is absolutly essential to self-satisfaction – at least for me, but I’m an insane perfectionist not often happy with anything I produce! I never read this book, but from the way you describe it it sounds a lot like Elizabeth Gaskell’s Cranford. That book is a classic and even though it doesn’t fit the conventional style of a typical novel, it somehow works. We’re talking alot lately about balance, aren’t we Nisha? Instinct and writing is kind of how I run- I’ve been learning how to analyze and break things down in the last while. It’s been a challenge but I’m feeling really comfortable doing it now. I’m not very read in the classics (shame on me!!). I’ll look her up, thanks for the recommendation! It really does, doesn’t it, Jennifer? The way we write changes so much over time I believe. Sometimes I’m anxious to see how it’ll be ten, twenty, or thirty years. And that thought molifies me when I’m feeling down and out about my own skill.